Mechanisms to protect areas of high natural resource value include conservation easements and transfer of development rights (TDR). 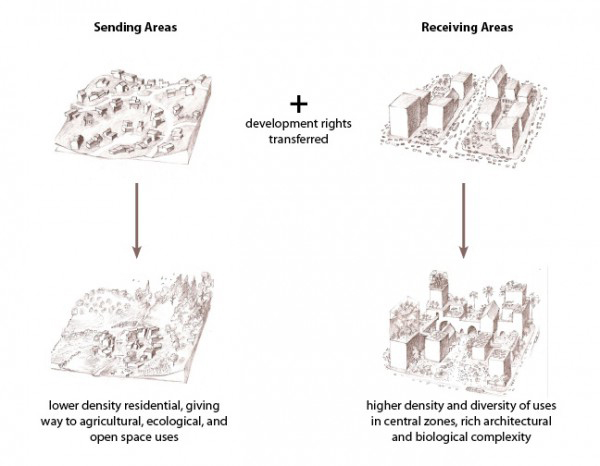 A TDR program is a way for landowners in less developed/“high value” areas (the sending area) to transfer their development rights to a high-density/growth area (the receiving area). Zoning ordinances and guidelines define the sending and receiving areas and assign development rights to sending areas. Landowners in sending areas can sell development right credits to developers who can then use them to increase the density on parcels in receiving areas. The seller can either agree to not develop their land, in which case a deed restriction is placed on the land, or agree to develop it at a lower density, with associated zoning restrictions placed on the property. TDR programs are intended to provide an economic incentive for preserving important open space, including riparian areas and groundwater recharge areas, allowing landowners to offset the development value of their property. TDR programs are permitted in Arizona, but are only effective where it is difficult to rezone property to allow for higher density. Arizona lacks a “purchase-of-development rights” program that would allow the use of public funds to buy lands to preserve open space. A conservation easement is a partnership between a landowner and an easement holder, usually a land trust or another NGO, where the landowner retains ownership of the land but forfeits the development right in exchange for compensation and tax incentives. Conservation easements are maintained on the land in perpetuity and are recorded in land records and on the property title. There are a number of examples of conservation easements in Arizona facilitated by The Nature Conservancy, the Trust for Public Land, and the Arizona Land and Water Trust; these easements were created in order to maintain river flow in the San Pedro and Verde Rivers and to protect ranches and farmlands. This has the effect of restricting future development, which can impact water resources, and retaining important open space resources. Conservation easements can be drafted to fit the unique goals of the landowner and the holder, to protect both the historic use of the land and its unique natural features. The Pima County Zoning Code offers property owners in designated sending areas an incentive to voluntarily forego or reduce development on their property by transferring their development rights to less sensitive, urbanized receiving areas. Calculation of development rights on the sending property is done by the County and is based on the maximum allowable development under the County comprehensive plan, existing zoning, or specific plan. Any existing development is subtracted from the total allowable amount. The number of rights that can be used on a receiving parcel is based on the greatest number allowed under existing zoning, the comprehensive plan, or a specific plan. Developers of receiving areas may apply for a rezoning to increase density, but the purchase of TDRs cannot be required as a condition of rezoning because it is a completely voluntary program pursuant to Arizona law. Sending areas are areas with very high biological and cultural resources such as the following: “important riparian area”, “biological core management area”, “special species management area”, or “critical landscape connection” area designated in the Pima County conservation lands system. Also included are “floodplain, geologic feature, recreation area or parkland, or land that has unique esthetic….value.” Receiving areas are those that have the potential for additional development, but lack the required zoning to allow it. Sending and receiving areas are designated on official maps. Landowners in sending areas do not have to sell all their development potential, but must proportionally limit new development. TDRs can also be sold to third parties for resale to receiving properties. The County’s interest is that their land conservation goals are met through the TDRs, not in their value. It considers transfers to be private transactions with the price established by the market and does not review or authorize their sale. However, the County may refuse to register a TDR if it does not comply with the County Plan and ordinance. The County issues certificates to track TDRs and to reduce the potential for fraud. The Pima County Title 18. Zoning, Chapter 18.92, can be found here. All About Conservation Easements published by The Nature Conservancy can be found here. Transfer of Development Rights is also featured in the Conservation Tools web site here.